Welcome to Day 7! If you haven't read about the giveaway and the rules, click here. 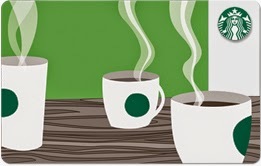 Day 5's giveaway prize is a gift card to Starbucks! Fill out the Rafflecopter widget below to enter! And check back tomorrow for the reveal of the Tweezerman prize! excited to see some good quality tweezers! I don't know if Tweezerman makes a lighted tweezer or not, but that would be nice! I always have SO much trouble seeing when I pluck my eyebrows!...lol! My tweezers aren't good anymore I need new ones!!! I love tweezerman so anything! I generally don't like spending money on "defense" products, as I think of them (tools, base coats, & other non-glamorous beauty items, as opposed to "offense" products: fun eyeshadow, nail polish, etc) even though, like on a team, the defense is just as important! It just gets less credit generally ;) Therefore, I think a cute-print, nice quality tweezer/manicure set would be awesome!